The 2011 ford ranger regular cab electric vehicle qualifies for a federal tax credit of up to $7,500, effectively reducing the net base price. The 2011 Ford Ranger finds itself surrounded by a number of newer and larger competitors, making it necessary for Ford to keep its compact truck competitive by offering ongoing improvements, fresh styling and rock-bottom pricing. Alongside the compact Ranger, only the Chevrolet Colorado and the Toyota Tacoma offer a regular-cab configuration, an appealing feature for those looking for a bare-bones truck. The Ranger SuperCab models feature two small rear doors, but no crew-cab model challenges similar vehicles from Dodge, Nissan and Toyota. With no V8 option under the hood, the Ranger also falls behind the class leaders in horsepower and towing capability. If you need a compact pickup that is inexpensive to own and operate, the 2011 Ford Ranger is one of the best. Available in everything from base two-wheel drive to highly capable off-roader, the Ranger is one tough truck. If you need a pickup to haul heavy loads or transport four people on a regular basis, you may want to look at a midsize V8-powered pickup. All 2011 Rangers are equipped with front seat-mounted side airbags, AdvanceTrac with Roll Stability Control (RSC) and a standard Class III trailer hitch. The 2011 Ford Ranger's handling and road manners have seen improvement through a series of recent suspension changes that include stiffer bushings, springs and shocks. As a result, the Ranger's rear end is far less prone to hopping about when crossing rough terrain and the steering response is direct and firm. To keep the base truck affordable, Ford equips it with a 2.3-liter four-cylinder engine and a five-speed manual transmission. This engine exhibits good acceleration so long as the Ranger is not weighted down with a heavy load. For those not so concerned with fuel economy, the 4.0-liter V6 is the engine of choice. Although not the most powerful in its class, the 4.0-liter engine provides the Ranger with brisk acceleration and a 6,000-pound tow rating when equipped with the 3.55:1 rear axle and automatic transmission. This optional feature allows the vehicle to be remotely started, a real advantage in cold climates. Available on the XL Regular Cab, this fleet-only option provides maximum cargo-hauling ability on a small truck. Although it still rides atop the same frame used for last 30 years, the Ranger has gotten a bit roomier than in generations past, with front seats that have deeply sculpted backs and new fabric choices. Legroom is not as generous as in some competitors, but SuperCab models do provide plenty of space behind the seats for luggage or groceries. As for backseat passenger room, the flip-down jump seats make for cramped accommodations and are best used for shorter trips. The Ranger features a number of audio upgrades, including a single CD player that can read MP3-formatted discs and an auxiliary audio input jack. Regrettably, Ford does not offer either the SYNC audio or a navigation option for the Ranger. The familiar Ranger exterior carries over after a recent freshening, touting a bold grille, bright colors and three attractive wheel choices. A raised "power dome" hood and an aggressive front valence help keep the aging design current. The Regular Cab models feature six- and seven-foot beds (fleet-only option on Ranger XL), while the extended SuperCab models come with a longer wheelbase and a six-foot bed. SuperCab models also offer rear-hinged half doors, which allow easier access to the cab area. The Ranger is equipped with a 2.3-liter engine, a five-speed manual transmission, anti-lock brakes (ABS), electronic stability control, side-impact airbags, a tire pressure monitoring system, two front cup holders, dual side mirrors, AM/FM stereo, 60/40 vinyl split-bench seat, power steering, tachometer and 15-inch steel wheels. Trim levels for the Ranger include XL, XLT and Sport. You can order your Ranger with shift-on-the-fly electronic four-wheel drive, five-speed automatic transmission, power windows, power locks, sliding rear window, cruise control, AM/FM stereo with six-disc CD changer, 4.0-liter V6 (SuperCab), limited-slip rear differential, fog lamps, door keypad entry system, remote start and 16-inch alloy wheels. The base 2.3-liter engine is fine for those who use their trucks to get around town and pull light-duty chores. 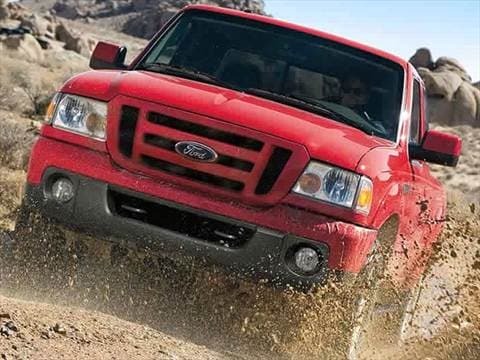 For those who do serious off-roading, towing or just like the feel of a V6, Ford offers a 4.0-liter V6 that produces 207 horsepower and 238 pound-feet of torque. If power trumps fuel economy, we highly encourage you to get the 4.0-liter, which will add to the price of most trims. The 2011 Ford Ranger XL Regular Cab's Manufacturer's Suggested Retail Price (MSRP) starts around $18,600, while the XLT trim with the six-foot bed starts closer to $20,000. The Ranger SuperCab XL starts just over $20,000, and a fully loaded four-wheel-drive Sport tops out around $29,000. Before you start negotiating price, be sure to check the Fair Purchase Price which shows what others in your area are paying for their Rangers. The Ranger line is expected to retain a slightly above-average resale value. Over a five-year period, Kelley Blue Book projects the Ranger to hold its value better than Dodge Dakota, be on par with the Chevrolet Colorado, but fall far behind the Toyota Tacoma and Nissan Frontier. Got about 2 years ago used and have not any problems with it. I get 18/19 mpg around town. Have not taken it on a road trip yet!